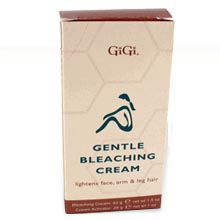 GiGi Gentle Bleaching Cream is a safe, fast, and easy way to lighten unsightly facial, arm and leg hair. When mixed and applied as directed, GiGi Gentle Bleaching Cream gradually lightens hair to a natural skin-tone shade. Contains Cream, Activator, Plastic Tray, Plastic Spatula and Instruction Booklet.